Today I'm going to talk about what elite squash players can learn from the duffers and hackers. This may seem like an outrageous concept at first, but after coaching for a number of years there are a few key things that most hackers do better or at least more effectively than the top club or even professional players do. Even the hacker with an ugly swing can teach good payers a thing or two. Of course the average amateur can learn much from top players, but this does go both ways. Here is a short list of what top players can learn from their lower ranked peers. 1. Hitting shots into unusual areas of the court can work at even the highest level if done at the right time. Amateurs likely don't hit these shots on purpose, but take note they can be extremely effective. I think all top players enjoy playing in a rhythm and knowing which shot will come next; it's just a matter if the quality is high or not. If you hit a variety of shots that keep your opponent out of or break up their rhythm it can be extremely effective. This is why the shot down the middle is now in the pro game. You can also try some of these rarely used, but highly effective shots: reverse boast, aussie boast, a trickle boast, a drop or hard low kill shot from the back. Even slight changes in your length and width can be effective. This could include hitting it looser, overhitting or under-hitting it or slowing the pace down. I believe there is a time and a place for any shot in the game; you just have to experiment with them all to figure out how and when each one will be most effective. 2. Many hackers aren't afraid to hit attacking shots and go for winners. This doesn't always have to be perfectly set up and can include attacking off a poor service. 3. 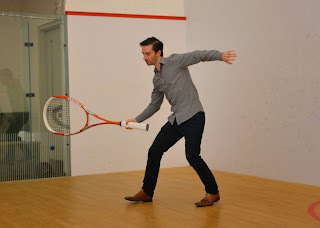 Don't take squash too serious. This doesn't go for all amateurs or hackers, but in general the general population is more relaxed and enjoys playing squash. Top players have put pressure on themselves and built up an ego and in turn begin working instead of just playing the game. This is what makes it difficult to play a game for work. Having balance, perspective and focusing on personal improvement should be core values. So I believe that pros need to learn how to play they way they enjoy playing effectively. Don't think you need to completely overhaul your game and play like some other successful person. If you focus solely on immediate results you may end up playing just to win and not how you enjoy playing. 4. Many of us end up with limited mobility either due to age or injury and because of this 'some' of us learn how to avoid having to scramble. This may mean changing your tactics as listed above in # 1 & 2 aren't afraid to go for riskier shots because this how they have to play. They also have to go for less margin on their short shots as they can't cover the next shot as well. This does generally mean a lot more errors, but this isn't a deterrent as it shortens the rallies anyways. You'll see most pros will rarely force a shot, but it is this line that you need to tinker with to really improve your game; being too conservative and overly aggressive. Some people's game suit the more conservative approach, but I think the slightly overly aggressive approach is better for a person's long term development. You don't learn how to hit winners by hitting everything deep and a foot over the tin. 5. Amateurs will play weaker players. This again doesn't hold true for everyone, but I've found most open and pro players don't enjoy playing against perceived weaker opponents. Of course this still does happen with amateurs too. I find it extremely important in a person's development to be able to dictate a rally and control the game. If you only play stronger opponents you will be practicing your defensive and retrieving skills, but this leaves a major gap in your training. Of course winning and controlling rallies is also crucial for a players confidence. I feel that most professional players (at least that I've come across) have a bit of an ego about their level and don't enjoy playing a friendly challenge match against a weaker player. Of course if they are far weaker this doesn't apply. I've noticed from doing lessons that some of the kids I coach get very good under pressure and handling tight shots, but then play someone their own level and really struggle against loose, under-hit and overhit shots. I've also noticed that some people are very comfortable being fed and their swing looks very smooth. But when that same person plays someone that hits unusual shots, like boasting a lot, hard low drives that land in front of the short line or go through the middle of the court the well grooved technique doesn't matter anymore. This is where people need to work their way through the hackers and play different style of players. Anticipation, quick reactions and good racquet preparation are all helpful for playing against an unorthodox player. Really you just have to get out there and keep playing with them until you get it. You need to be on your toes and really focused and ready for anything. This can even go different serves. Some people have no trouble returning a good serve that hits the sidewall at shoulder level, but when hit right at them or low and hard they end of making poor shot selections or simply are unable to take their regular swing and pop out a loose shot. I remember the feeling of being a top junior and being so frustrated about losing to hackers. I swore I was better and couldn't understand it. You can't skip this level. So don't get frustrated. You may even pick up a few tips from playing these hackers. In the end there are countless ways to win points, maybe you'll learn some new methods from playing them. If you're one of those top players and you have been plateauing for some time now maybe it's time to take some notes from one of your club amateurs or the list above. The best players from all sports are always open to learning, regardless of the source...which means yes, even if they don't hold the racquet properly you may still be able to learn something from your weekly hacker; just don't try copying their technique! And finally, is a bad shot really bad, or is it how it's packaged; that it has not been played intentionally? So does this mean a bad shot played intentionally at the correct moment can be considered clever and indeed a good shot? I'd like to think so.